Dental problems and infections are very common in cats – especially as they get older, and, knowing what toothache feels like, it’s fair to say it’s probably painful for our feline friends, too. Once any problems within your cat’s mouth have been diagnosed and treated, you may be surprised by how much happier the cat seems. As with anything, prevention is better than cure, so implementing a good dental routine with your cat is very important. Rubbing the mouth, scratching, or pawing. Drooling excessively or producing more saliva than usual. Seeming overly sensitive or sore around the mouth. Redness or inflammation to the tongue or gums. As well as regular checks of the teeth and mouth, your cat can be trained to tolerate having his or her teeth cleaned – though this may not be easy unless started at the kitten stage. Begin simply by slowly rubbing your cat’s teeth, before adding the toothpaste and eventually introducing a soft brush. Special cat toothpaste and soft brushes specifically for cats are readily available. As with humans, this is the best way of removing food or plaque from the teeth and thus avoiding many cat dental problems before they even begin. Feeding a good quality, specially formulated dry cat food. Dry cat foods are good for your cat’s dental health because they exercise the teeth and gums. Some cat food manufacturers even produce dry cat foods specifically formulated for oral health, offering even more benefits than a good dry cat food. They contain fewer deposit forming minerals which could coat the teeth. The dry kibble is shaped to help clean teeth, as well as the special fibrous structure. There are also many other products specially developed to promote feline oral hygiene. The efficacy of these is still to be proven. There are products which are designed to be applied directly onto the teeth, and some which can be added to everyday cat food or drinking water. Damaged teeth – whether completely broken or just slightly chipped – should always be cause for concern. All but the most minor chips should be checked properly. If the gum is open or the root at all exposed, the damage should be treated as the cat could be susceptible to an abscess – which can cause terrible pain – or infection. Completely broken or loose teeth – possibly as the result of an altercation with a car or a fall (yes, cats usually land on their feet – but the chin can often take the impact, too) can compromise the cat’s ability to eat healthily or cause the cat pain. Sometimes a cat’s tooth enamel can wear away, a condition which we still don’t fully understand. Treatment is simply tooth extraction to ease the pain the cat feels, as the sensitive part of the tooth can become exposed. Periodontis is generally triggered by a build-up of tartar and can cause the gums to recede. This in turn can lead to infection from bacteria getting into the resulting space between the tooth and the gum. Gingivitis is a condition which causes inflammation and bleeding of the gums. This too can be caused by build-up on the gums, but often it’s a symptom of another underlying health problem. 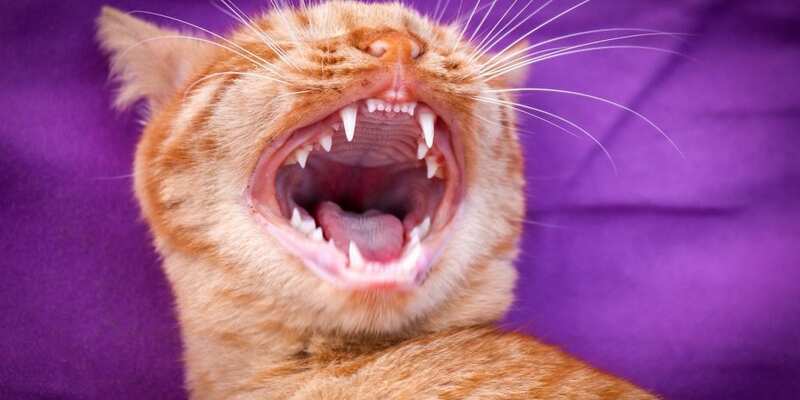 Viruses – including feline immunodeficiency and feline calicivirus – can also cause dental health concerns, and the overall state of the cat’s oral health – and most pertinently the gums – can often be indicative of illnesses of the kidneys or other organs as well as various immune disorders. Make good oral hygiene and dental care as much a part of your cat’s routine as it is your own, and ensure rapid treatment should any problems occur. Keep up to date with vet check-ups and vaccination reviews and discuss any concerns with your vet. A happy mouth can mean a happy cat for much, much longer – and that’s all most cat owners want for their pet – don’t you?